Cut a small amount off the shorter side of the squash to give your squash a good base. Cut the top off of the other side and scoop out the sides and the middle, leaving about 1/4 of the flesh. Roast in oven or on a BBQ. Bring 1 cup quinoa and 2 cups chicken stock to a boil and then turn to low heat. Cook with a lid on for 20 minutes or until all the liquid is absorbed. While the quinoa is cooking, saute the shallots, garlic, raisins and pine nuts in a pan until golden brown and set aside. Once quinoa is done, mix in the sautéed ingredients. Add fresh oregano and salt and pepper to taste. 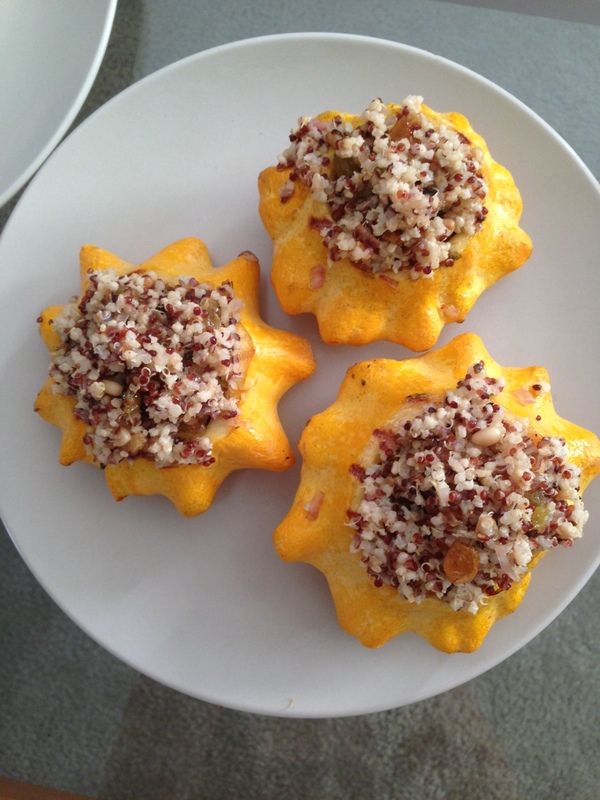 Stuff your squash with the quinoa mixture and enjoy!